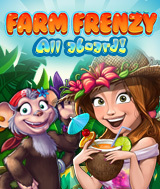 Discover Farm Frenzy - Heave Ho and enjoy a tropical farming adventure! When the animals of an abandoned island need Scarlett's farming experience she can't let them down. Help the animals provide for themselves and teach them all about running a good farm. Grow crops, feed animals, and gather produce to earn money and grow your farm. Roll up your sleeves and play Farm Frenzy - Heave Ho now!